YouTube recently added a way to see who your new subscribers are from the mobile versions of the YouTube app. If you’d like to see how to do that with an ios device you can find out here. I’m was relatively new to YouTube as a channel provider when I first wrote this and I’d searched for way too long trying to figure out who my channel subscribers were. I also found it difficult to approve individual comments thereby allowing them to show up underneath their actual videos in YouTube. When I finally figured out how to do both I wrote this. That was about a year and a half ago. Since that time my channels subscribers have more than tripled…from 17 to 60! Surprisingly my steps for finding out who your subscribers are hasn’t changed. What has changed is how I manage comments, which I get a lot more of these days. I show 2 methods further down. It’s weird, and I don’t know why, but certain videos of mine just seem to always get comments. Other, equally popular videos have never had a comment…not even 1…I don’t really get why that is. There’s one video which gets several comments every week. In it I show people how to break off blades on box cutters safely. It’s such a simple concept but I’m approaching 23,000 views in less than a year’s time. If anyone has any insight into this I’d love to hear it! 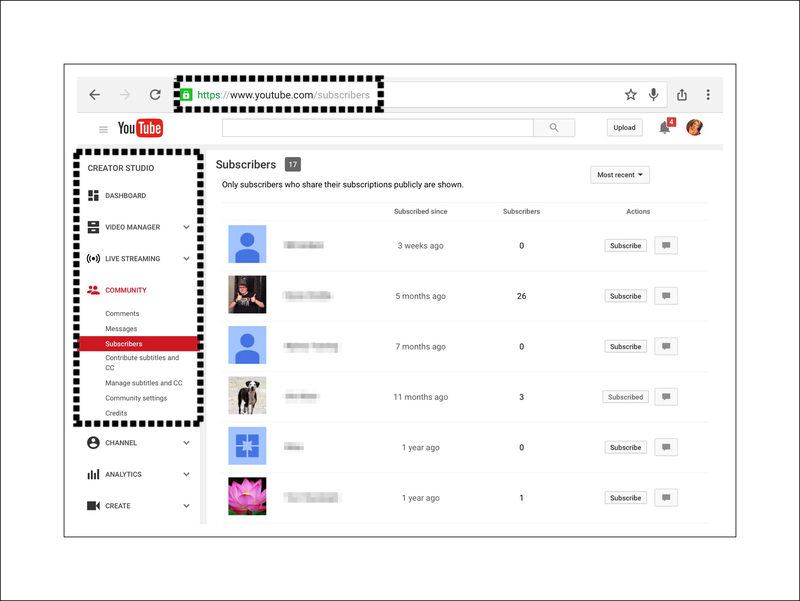 You can’t see who your subscribers are using either the YouTube app or the Creator Studio app on an iPad. 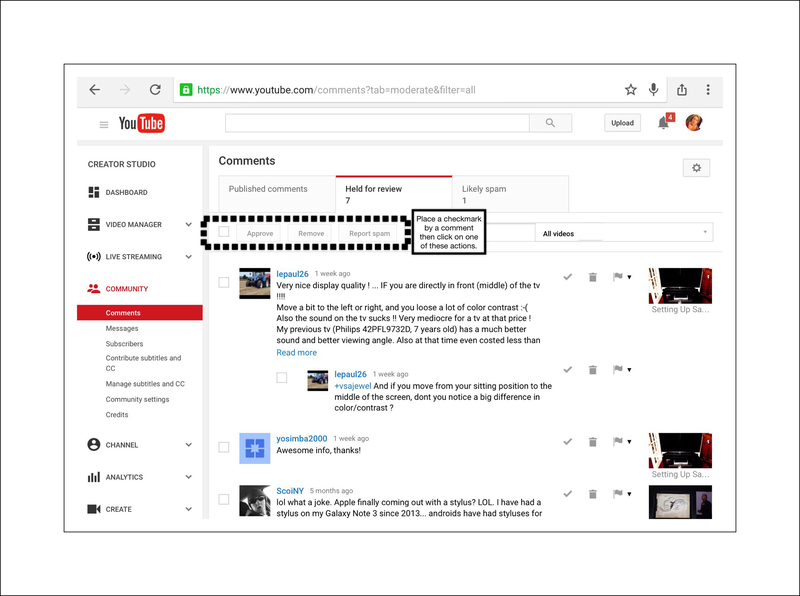 You can manage comments however using either app…I’ll show you how to do that via Chrome next. 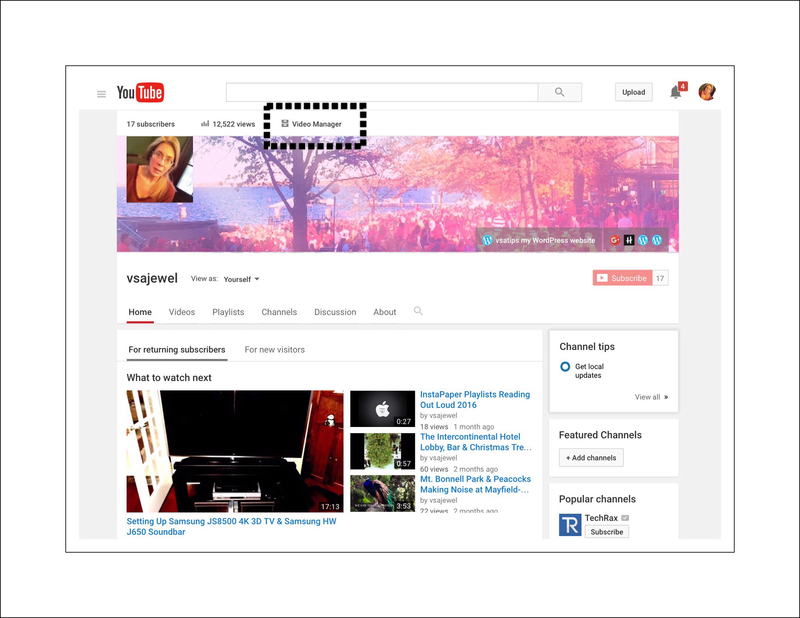 To find out who subscribes to your channel using an iPad the best way to do this is by using the Chrome app. The steps would essentially be the same if you’re using an Android device…just a few less steps…because you already have Chrome. If you’re on a Windows mobile device I suspect Chrome is still the best option…but it’s been a while since I’ve used one…that was what I used when I did. If you’re using a computer the steps are essentially the same too…you can just skip things like switching to desktop mode. First download the Chrome app and login to your Google account for the channel in question – since I’m writing this on an iPad the Chrome app is essential…you can no longer manage your channel using Safari on ios. 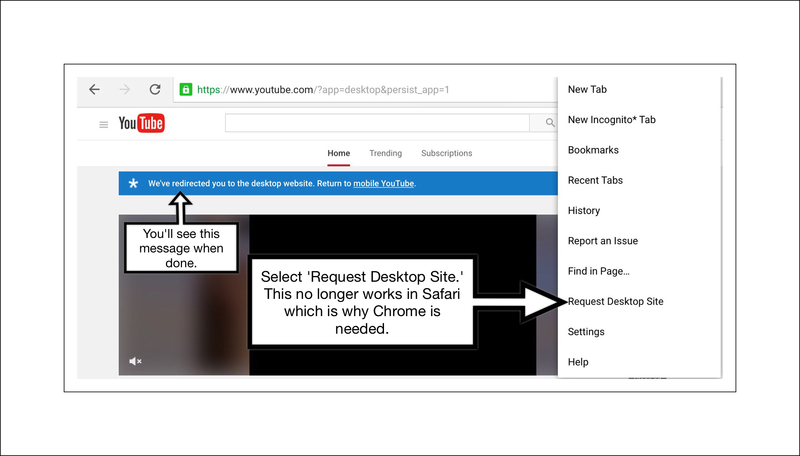 Go to your channel (here’s mine) and switch to Desktop mode if you’re using a mobile device. Once you’ve arrived at your channel…tap or click on the hamburger menu in the upper left corner…that’s the 3 horizontal lines that sort of resemble the form of a hamburger. When you do that the YouTube menu opens in the left hand column. Locate the words ‘Video Manager’ in the middle top portion of the screen and tap or click on them. 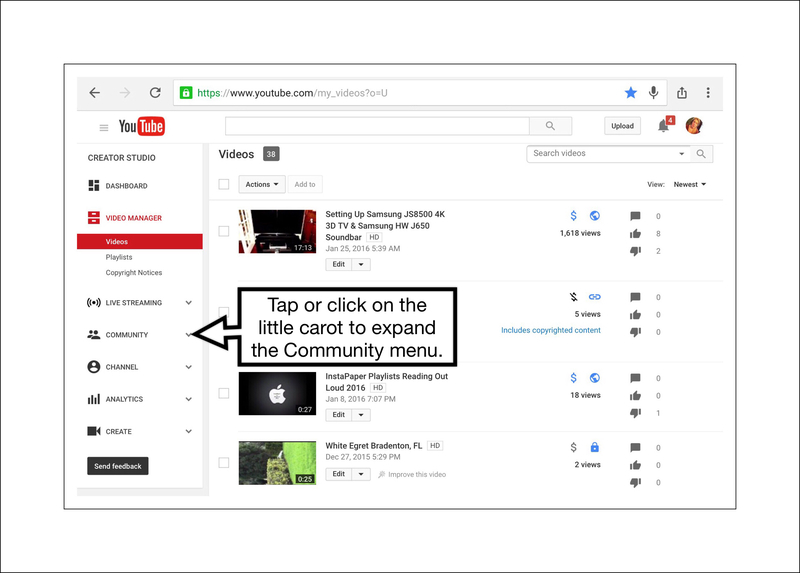 When the next left hand side menu is displayed look for the Community menu item and expand it…once it’s expanded you’ll see where both Subscriber and Comments settings are. Go back to the Community menu discussed above and select ‘Comments‘ instead of subscribers. Once the comments are displayed, you can manage each one individually or in batch mode. Refer to the notes on my screenshot below for more help managing comments. While this video isn’t very exciting or entertaining, I love it because I love the subject matter. A few years ago my husband gave me the Fujitsu ix500 scanner as a birthday present and this scanner is so amazing that it’s literally changed my life. I was struggling with too many paper documents and finding places to put things that I knew I should save but that I was running out of places to store them, Consequently I had stacks of things lying around that annoyed us both, I’m a huge user of Evernote and had asked for this relatively new Wvernote scanner for my birthday. Neither of us knew that there were actually 2 very similar scanners and the one he gave me was the wrong one. But it turns out it really wasn’t. The one I received ended up being more versatile and so incredibly useful that he and I both use it almost daily to scan in documents that we store in Evernote, or send to someone so we can get rid of the paper copy. Our home is finally free from stacks of documents and Fujitsu just keeps making this scanner better with added features via software updates. There are obvious pros and cons to Google’s penchant to improve their products. The most significant con imo is that oftentimes when the changes are implemented there’s a learning curve which takes time to master. There’s probably a direct relationship between age and adaptability…because our kids don’t seem to struggle like my husband and I do with these changes. If anyone reading this post discovers that recent changes cause my information to no longer be accurate, please let me know using the comment feature below (I don’t require your email address or anything really to comment) so that I can fix this post to remain helpful! While researching how to play videos using ios 9’s multi-tasking capabilities with YouTube (this isn’t possible using the YouTube app) I ran across Google’s updated support page for uploading videos on different devices. Here’s a link to the page and below is a screenshot of their step-by-step instructions for iPads. I really have grown to love the Creater Studio ios app and that’s what I use now to mange all my comments. Just use the ‘Comment‘ menu item on the left and read my notations in the screenshot below. Tapping on the small downward pointing arrow is the key to finding where you can approve and reply to comments. I solved part of that with my description above, but there was still an issue I chose to ignore for this post…what happens when you approve all comments and the Comment Number doesn’t become Zero? This entry was posted in Videos, YouTube, YouTube Channel and tagged Creator Studio app, manage Youtube comments, Productivity, view YouTube subscribers, who subscribes to my YouTube channel?, YouTube Channel, YouTube Comments, YouTube Subscribers. Bookmark the permalink. Hi, I’d love to learn more about how to use keywords well. I’m pretty much of a noob regarding keywords. I think I have a better handle on using them for this blog, then I do for YouTube. But I agree with you…that would help me learn more about how to use them too I think. Thanks so much for the idea!